Donald took a lot of pride in his socks. He wore striped socks, argyle socks, checkered socks and socks with all sorts of funky patterns. Sometimes he wore 80s-style socks with bright stripes across the top. Other times he wore solid-colored socks in every color imaginable. On holidays, he wore socks with images to reflect the holiday themes. Usually, his socks matched the clothes he was wearing, or the mood he felt. Other times he mix-matched his left and right socks just to spice things up a bit. People often complimented his socks, but sometimes bullies made fun of them. Donald didn’t mind because his socks were his passion. He put a lot of work into his sock choice every day and he acquired an impressive collection over time. 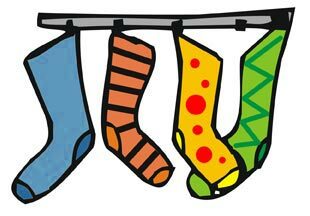 There was only one type of sock forbidden in his wardrobe: Donald hated plain white socks. White socks were boring. White socks were common and unoriginal. White socks showed every speck of dirt on them. When Donald saw someone wearing white socks, he thought of little kids whose mothers dressed them, or helpless middle-aged men whose mothers still bought socks for them. Plain white socks made him cringe, and he would rather walk barefoot over broken glass than to be caught wearing them. One day, Donald’s worst nightmare became a reality. It started on a brisk autumn morning as he walked to his favorite coffee shop for a cup of tea. He had just selected a pair of yellow and brown polka dot full crew cotton socks with medium-gauge ribs and extra heel supports and he thought they matched the season perfectly. There he was, minding his own business when he strolled past a dark alley. Without warning, a hand grabbed Donald and pulled him into the alleyway. When Donald regained he bearings, he saw a man in a dark trench coat holding a suitcase in his left hand and a gun in his right. The gun was pointed at Donald’s chest. Donald had feared this exact scenario for years! He couldn’t believe it was actually happening. This was his most dreaded decision, and no matter how many times he imagined it in his head he never knew which choice he would make. He weighed the pros and cons of each, and his nerves were overbearing. Sweat beaded on his forehead and his palms felt clammy. “Thirty seconds left,” the man said. Donald thought he should just do it, as other people would surely agree, but one look at those crime-of-fashion foot warmers made his stomach turn. He had survived for decades without succumbing to the white socks he loathed and it pained him to think that streak would all end here. No matter how many times he pictured himself pulling them on his feet, it just didn’t feel right. Donald didn’t want to do it. He felt noble standing firm in his resolution. He felt that to refuse, to take a bullet for his passion, would allow him to die the death of a hero. It would bestow upon him the honor that most people never found in their lives. He wanted that honor, but he also wanted to live. He wanted to live a long life and to see and do many things he had not yet done. He was scared—scared to die. “Okay, okay! I’ll do it!” Donald said. And he did it. He put on the socks and posed for a photo. The man held true to his word. He gave Donald a briefcase containing ten thousand dollars in small, unmarked bills. Donald used some of the money to buy more socks, but it just didn’t feel right. The money felt dirty. His socks never gave him the same joy again after that fateful day. It was like each and every pair he owned knew that Donald betrayed them. Donald felt like a phony. He had his good days from time to time, but they never lasted. Every so often, the photo of Donald wearing white socks resurfaced on Facebook and it brought the turmoil of that tragedy back to his mind in full bloom. Life never again gave him the sense of hope that it once did. The years passed and Donald succumbed more and more into isolation and depression. He always wondered if he made the wrong decision.